Americans filmgoers are a fickle bunch. They tend to ignore any movie with subtitles and any movie that occurs outside their comfort zone. This is what makes Enemy at the Gates so strange. It takes place during the battle of Stalingrad, which pitted Germans against Russians in World War II (that means no Americans). The cast is primarily from over the pond, although each has recently been making inroads into mainstream movies. In other words, this is almost an art house film, hiding as a more mainstream one. At times, Enemy of the Gates is taut and compelling, and at other times, it borders on okay. This is because of its partially successful attempts to merge a love story and a battle. The latter story, which uses the fight between two snipers as sort of an allegory of the larger battle, succeeds. The character of Vassili Zaitsev is historical, but Enemy of the Gates gives him a fictional opponent. There will be many comparisons made to the beginning of this movie to Saving Private Ryan. Rural youth Vassili (Jude Law, The Talented Mr. Ripley, eXistenZ) finds himself in the midst of the horrific battle. People around him are dying, and there is nothing he can do. The footage is grainy, and the camera moves violently, as if it is part of the battle. 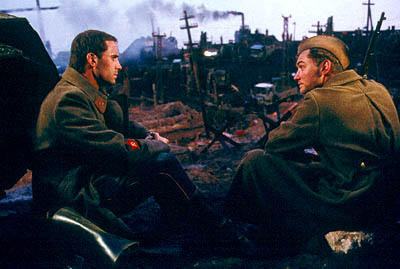 Once the battle finished, Vassili meets Danilov (Joseph Feinnes, The Very Thought of You, Shakespeare In Love), a political officer. Danilov witnessed Vassili accurately shoot a number of Germans, and decides to build him up as a hero. Vassili joins the sniper division and begins picking off Germans, while Danilov publishes his exploits. Vassili and Danilov's attraction to Tania (Rachel Weisz, Sunshine, The Mummy Returns), another sniper, begins to strain their relationship. The largest strain comes in the form of Konig (Ed Harris, Pollack, The Third Miracle), a German sniper who arrives to challenge Vassili. Weisz has it the worst. She has some truly atrocious dialogue in a role that never feels like it belongs. Sometimes, Feinnes and Law's dialogue borders on the fromage. The love triangle does not work because it feels so contrived. Enemy at the Gates focuses on Vassili and Tania rather than the growing fracture between Vassili and Danilov. The movie also never really portrays the extent of their friendship. They seem close, but all the viewer saw was how they met. In fact, Feinnes does not have much to do. He is a fascinating character who gets the short stick for most of the movie. Harris is lucky. He has few lines in the story by co-writers Alain Godard (Wings of Courage) and director Jean-Jacques Annaud (Seven Years in Tibet, Wings of Courage). Harris' character is the steel-jawed silent type, who lets his eyes do all the talking. The impressive elements come from the test of wills between Konig and Vassili. Godard and Annaud portray Vassili as a young, unassuming man, and Law successfully conveys this. He revels in the fame that Danilov gives him, but when confronted with Konig, he feels extremely inadequate. Konig is his first real challenge. They must use cunning and strategy to outwit each other. Unlike most other war movies, Konig and Vassili cannot just charge forth with guns ablaze. They must sit and wait patiently for the correct opportunity to arise. The two sit in decrepit warehouses and run through shell-ravaged Stalingrad. The movie looks wonderful. The city is in ruins, and all the inhabitants are grimy and look as if they are barely hanging on. Still, Enemy at the Gates switches back and forth between Konig and Tania, lessening the overall tension, which reflects upon the movie as a whole. 2 hours, 11 minutes, Rated R for strong graphic war violence and some sexuality.